A quality face cleansing brush allows you to keep your skin clean, properly exfoliated, and blemish free without having to pay spa prices for facial treatments. Even a cheap facial cleansing brush can take your skin to the next level and have you selfie-ready in no time. But how do you know which brush is best for face cleaning when there are so many to choose from? Easy, that’s where we come in! Our research team has been busy reviewing cleansing tools from sonic cleansing brushes to exfoliating body brushes – now, the results are in! We’ve prepared a simple buying guide below. But before we dive in, look over this list of important specs that may make your buying choices even easier. 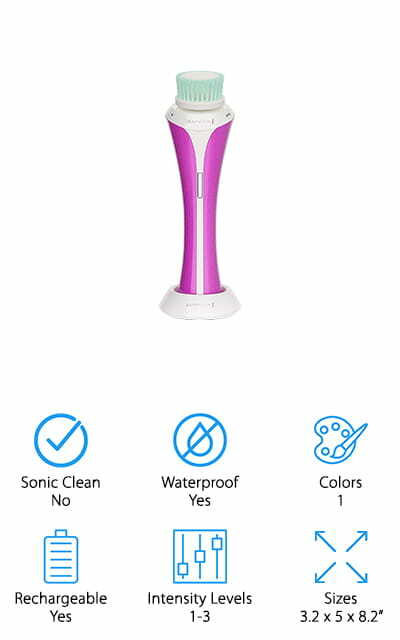 Sonic Clean: A sonic cleansing brush is one where the bristles on the brush oscillate at a sonic frequency. This rapid movement of the bristles deep cleans the skin to get rid of makeup residue hiding in your pores while it gently exfoliates. 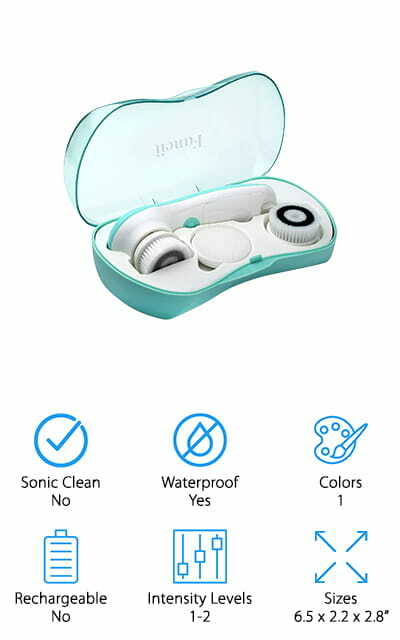 Waterproof: Having a waterproof facial cleansing brush is very important if you are a person that likes to do your scrubbing while in the shower. Brushes that are not waterproof should not be used or stored in the bath or shower. Colors: A lot of women like to coordinate their bath and beauty supplies. So, knowing how many colors and styles a product comes in is always important, right? Exactly. That is why we made sure to include the color options in all of our reviews. Rechargeable: A lot of the top facial cleansing brushes include an internal rechargeable battery which can be a great option for those that would rather not have to worry about keeping plenty of batteries around the house. Just plug, charge, and go! Intensity Levels: Many of the brushes that we have researched and reviewed come with adjustable intensity levels so that you can control your level of clean. It is a great feature for those that have sensitive skin and prefer a more gently touch. Sizes: The size of your facial brush or exfoliating body brush can be a huge factor to consider when making a purchase especially if storage space for your beauty supplies is an issue or you may need something very compact for travel purposes. We have uncovered a nice range of impressive yet affordable facial cleansing brushes in our research. The list should contain at least one brush that is perfect for your skin care needs, whether you are searching for a sonic and exfoliating deep cleaning tool or just something to make your morning routine a little quicker, one of these ten brushes is sure to have you putting your best face forward. So what are you waiting for? Let’s get scrubbing! 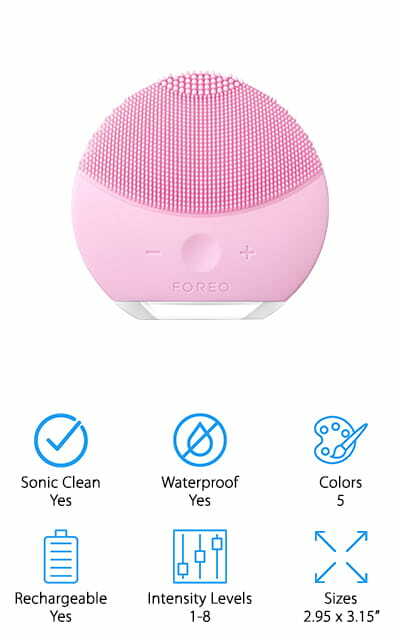 The Foreo Luna Mini 2 is the best facial brush for sale! It may be smaller in size, but it still brings all the facial cleansing power of its larger counterpart with three cleansing zones and eight different levels of intensity. No matter if your skin is oily, dry, combination or sensitive the Luna Mini can still get the job done because it is covered with silky soft medical-grade silicone bristles that deep clean without damaging your sensitive facial skin. Available in Aquamarine, Fuschia, Midnight, Pearl Pink, and Sunflower Yellow. Plus, you can get up to 300 uses out of a fully charged battery! The silicone dries very quickly to keep the brush and the exfoliating bristles from getting contaminated with bacteria, and since it is waterproof, it can be used in the shower. The Luna Mini is large enough to be held comfortably but small enough to toss in your travel bag. It pairs perfectly with your favorite cleansers, and since it is rechargeable, you don’t even have to worry about keeping spare batteries on hand. The Pixnor Facial Cleansing Brush is our budget pick for those that want to save money but still want the camera-ready skin. The two intensity levels paired with the seven different brush heads can get your face feeling clean and fresh, no matter if you have oily, dry, combination or sensitive skin. 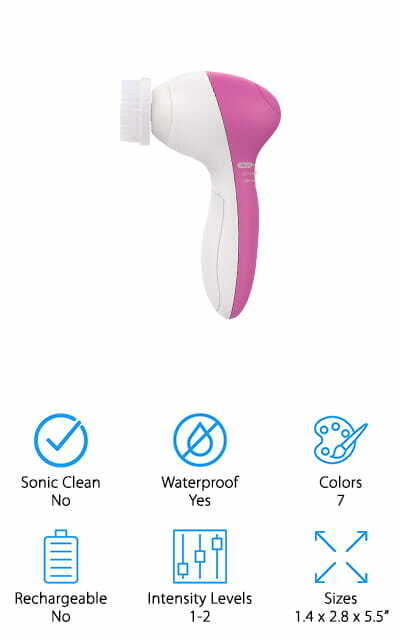 The waterproof design has a comfortable handle that gives you a spa facial experience in the comfort of your own home! The brush heads include three smaller ones for face cleaning, a sponge head for the washing away the day’s makeup, a pumice head for exfoliating those less than soft areas, and a special massage brush to make your face feel amazing. It is safe to use in the shower or bathtub! The Pixnor is suitable for all skin types, and because it can be adjusted to a lower setting, it can even be used by those with sensitive skin. Up your skincare game at an affordable price point! 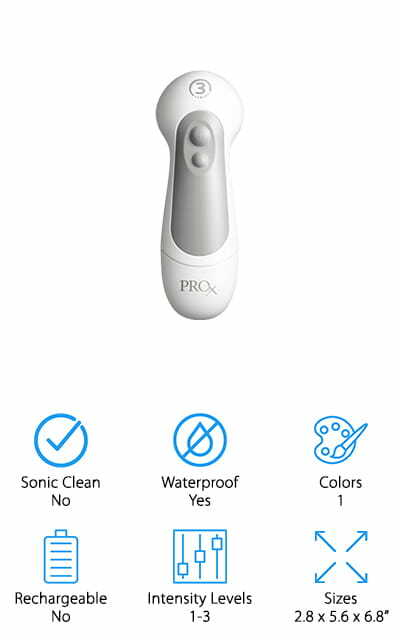 The Olay ProX Microdermabrasion facial cleansing brush is a special dermatologist designed a system that brings all the facial cleansing power of the professionals with three speeds and various brush heads; it is a two in one system that packs a punch! No matter if your skin is oily, dry, combination or sensitive the microdermabrasion system will exfoliate your skin to remove the dull surface area and leave you looking silky soft and radiant. The rotation of the bristles is gentle to the skin, deeply cleans, and clears pores. For daily cleansing, the slowest speed should be used, but the microdermabrasion speed can be used twice per week to keep your skin looking bright but not over-exfoliated. Many people notice an improvement in fine-lines and hydration after only a few uses! The ProX pairs best with the Olay ProX line of cleansers, and the brush heads are good for up to three months before they have to be replaced. The Etereauty Facial Brush is a very good choice for those that crave camera-ready skin. The two intensity levels can be used with the four different brush heads to get your face and body feeling clean and oh so smooth, even if your skin is oily, dry, combination or sensitive. The waterproof design paired with the comfortable handle gives you that professional spa facial experience without ever having to leave the house! The brush heads include a cleansing brush of super soft silicone for those with sensitive or dry skin, a soft nylon bristle, an exfoliating brush that can be used for your body or face, and a pumice head for those stubborn calluses. Plus, because it is waterproof, it is safe to use at the sink or in the shower or bathtub! The Etereauty brush is a great addition to your current skin care routine or the perfect facial cleansing brush to start your brand new skin care routine! The Fancii Waterproof facial cleansing brush is a special compact and portable system that brings all the facial cleansing power you could possibly need with its two intensity levels and three interchangeable brush heads, and it all fits into its very own storage case! No matter if your skin is normal, oily, dry, combination or sensitive the microdermabrasion system will remove makeup and dirt while exfoliating your skin to create a vibrant surface and leave you looking radiant like you just had a facial. The rotation of the bristles is gentle on the skin, yet still deeply cleans and clears pores. The handy storage case fits easily in your vanity drawer, travel bag, or even your purse. You never have to worry about keeping up your skin care routine because you can always take it with you! Safe to use in the bathroom or shower due to the waterproof casing, and the Fancii exfoliating cleansing brush runs on AA batteries. 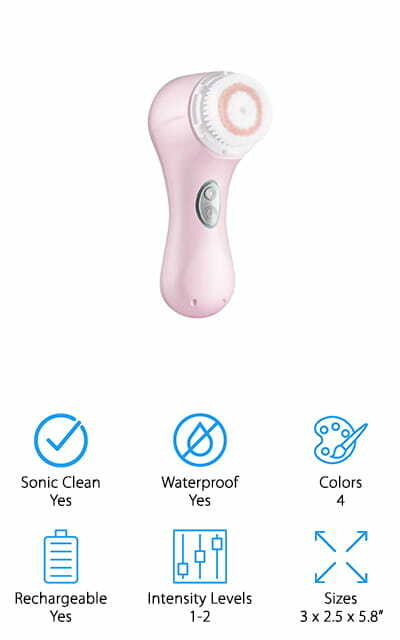 The Sonic Facial Brush by MiroPure is made with active technology to bring you a powerful facial cleansing system with four cleansing speeds and two different cleansing brush heads. Even the dirtiest skin is no match for this exfoliating cleansing brush and deep cleaning system! Whether your skin happens to be oily, dry, combination, sensitive or even normal, the Sonic Brush will have your pores clean and clear, removing blackheads, because the brush heads are covered with super soft bristles that deep clean without damaging even the most sensitive of skins. Available in aqua or pink to match your other favorite beauty supplies. Plus, it comes with a rechargeable battery and charging stand that includes a USB plug! 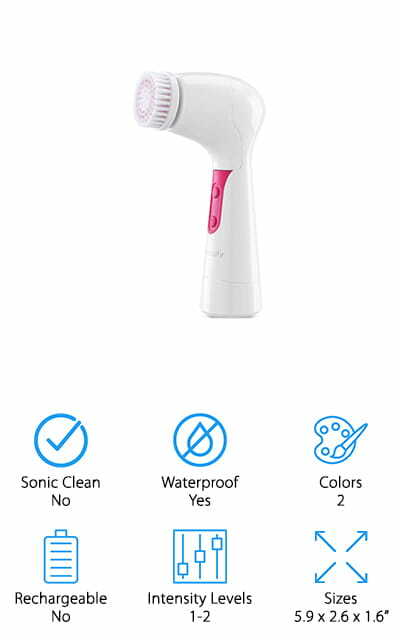 The brush heads are fairly easy to clean, and since the Sonic Facial Brush is waterproof, you are free to scrub in the shower! Use the MiroPure Sonic body exfoliating brush to keep your entire body free of dead, bumpy, or flaky skin. The Remington facial cleansing brush offers a dual action brush head that rotates and vibrates to give you can get a deep clean, but the bristles are gentle enough for everyday use. The three intensity levels make this facial cleansing brush an ideal choice no matter your skin type: normal, dry, oily, or combination. The illuminating head helps reveal the details of your skin so you can focus on exfoliating the problem areas. The rotation of the bristles supplies the gentle cleaning and clearing of the pores, and the vibrations help with the scrubbing and exfoliating. The cordless and rechargeable brush is safe to use in the shower for ease and comfort, and the battery gets up to 30 uses before needing to be recharged. The Remington also has a 1-minute timer that pulses every 20 seconds to help you get a thorough cleansing without over exfoliating! The user-friendly handle was designed to make cleaning all angles of the face comfortable and easy. The Essential Skin Cleansing Brush is an outstanding choice for those that yearn for glistening smooth skin. The single intensity level makes using the Essential brush a breeze without losing any cleaning power because of the four different brush heads included. Your face and body will be feeling clean and looking stunningly smooth, whether your skin is considered oily, dry, combination, sensitive or normal, The waterproof design and the comfortable handle give you a professional spa facial experience at your bathroom sink or even in the shower! The rotating brush heads include a cleansing brush with softer bristles for daily cleansing or for use on sensitive skin, a firmer cleansing brush for a deeper, exfoliating cleansing, a larger body brush for cleaning and clearing the skin on the rest of the body, and a pumice stone for removing calluses and dry patches. The Essential four brush head system will be an excellent addition to make your current skin care routine more efficient! The Wowlily facial cleansing brush is a great little brush that is completely portable! The plus or minus intensity levels let you customize your facial cleansing power. 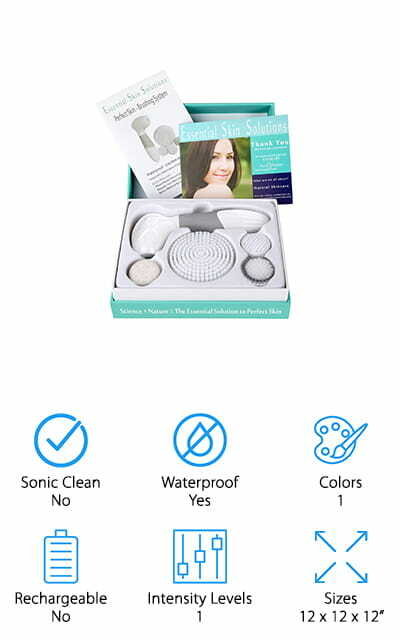 The bristles are made from a super soft silicone material, and they have varying lengths per side so that no matter what your skin type is (normal, oily, dry, combination or sensitive) the gentle sonic vibrations will remove dirt and buildup from your pores while exfoliating your skin to leave you looking radiant, like you just left the day spa. This brush is gentle enough for sensitive skin without losing any of its effectiveness. It is small enough to fit easily in your vanity drawer, makeup bag, or even your purse keeping you from having to worry about your skin care routine while on the go! Safe to use in the bathtub or shower due to the waterproof design, and the Wowlily exfoliating cleansing brush is fully rechargeable using the included USB cord. 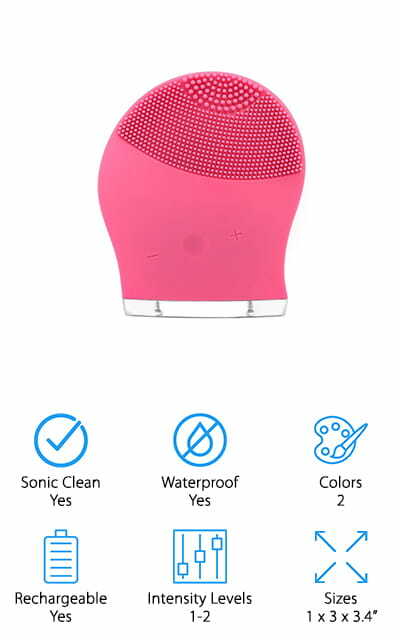 The Clarisonic Mia 2, a sonic facial cleansing brush, is made with a patented sonic oscillation technology that will bring you a gentle facial cleansing system with two intensity levels (universal and delicate) and customizable cleansing brush heads (everyday cleansing, targeted cleansing, or beyond cleansing). Even the dirtiest of pores are absolutely no match for the Clarisonic exfoliating cleansing brush and deep cleaning oscillating system. 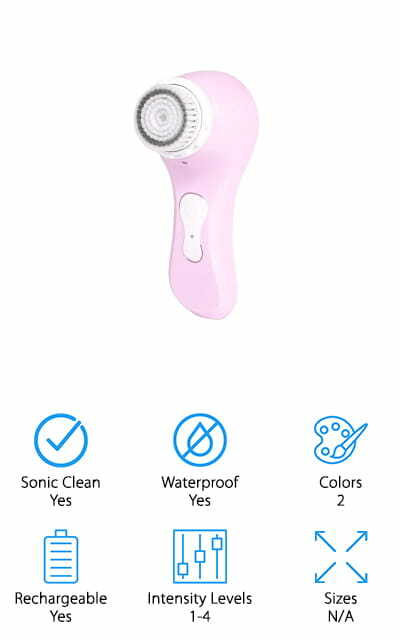 No matter if your skin type happens to be normal, oily, dry, combination, or sensitive, the Mia 2 will have your pores free of clogging dirt, clearing blackheads, because of the sonic vibrations paired with the oscillating super soft bristles deep clean without damaging the delicate skin of the face. Available in lavender, pink, seabreeze, or white to match all of the other favorite beauty supplies you already own. It also comes with a USB charger and a travel case. The Clarisonic Facial Brush is waterproof, so you are free to scrub in the shower or bathtub!